Interesting InDesign problem: the format for a modification date variable changes per document. Suppose you have a text frame containing the file modification date variable, created using Type → Text Variables → Insert Variable → Modification Date, displays as “14 September 2011 7:50 PM” (on my system). Now open an existing document that was created on a different system and copy and paste the text frame containing the date variable. But depending on what system created the other document the date displays using a different format, e.g as “September 14, 2011 19:50”. It appears that the date format is determined by the document in which it is placed, rather than by the date format in use when the variable was created. Workaround: define a new / custom text variable that uses the file modification time but with your own explicit format, then insert your custom variable instead of the pre-defined “Modification Date” variable. In my brief testing this custom variable and its format is preserved when pasting the text frame into other documents that were created on other systems. But now I want to know exactly how the format is chosen for the built-in “Modification Date” variable. I am guessing that when a story with a variable is pasted into a document the format is determined by the format of an existing variable of the same name, and if there is no existing variable of that name then InDesign brings in the new variable definition (along with its format) from the clipboard. No, that’s not what I mean… why the default date format? I tried changing the date formats in System Preferences. Doesn’t seem that InDesign picks it up from there. I tried trashing the Adobe InDesign preferences folder, changing the date format in System Preferences and launching InDesign again. InDesign is still using the original format, so doesn’t get it from the user’s preferences. I had a look through ~/Library/Preferences/com.adobe.InDesign.plist but nothing date-related in there. So I gave up. I will leave the investigation for some day when I am younger and it is more important to understand how Adobe’s InDesign picks the format for the built-in date modified variable. The workaround works around. 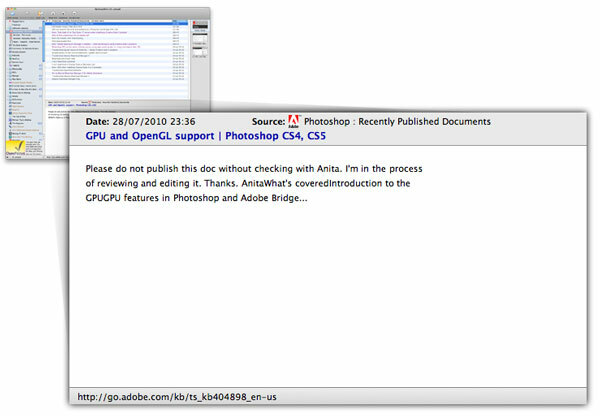 This entry was posted in Blog and tagged adobe, indesign on 14 September, 2011 by david. 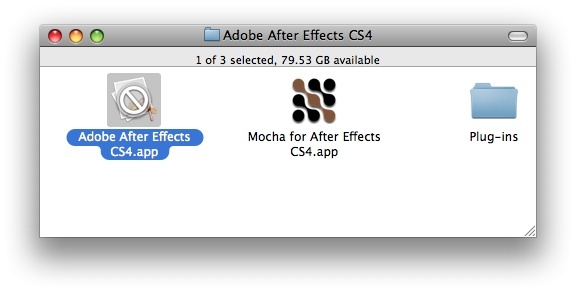 Pierre Igot‘s post about Adobe’s use of a new cursor in CS5 draws attention to how Adobe is continuing to fail to adhere to Macintosh user interface conventions. But I disagree that the correct cursor to use for a blocking task that cannot be cancelled is the spinning beachball of death. That cursor after all is the cursor automatically provided by the operating system when an application is not responding to input events. As such when I see the beachball I associate it with a stuck application, one that may need to be forcibly quit. Previous versions of Photoshop showed the watch cursor for actions which took a significant length of time. Showing the watch cursor is friendlier than showing the beachball of death because it indicates that the application is busy, too busy to handle your clicks but everything is hunky dory and the train will arrive at the station. If you have Xcode 3.2.2 installed you can find this in /Developer/SDKs/MacOSX10.6.sdk/System/Library/Frameworks/Carbon.framework/Versions/A/Frameworks/HIToolbox.framework/Versions/A/Headers/Appearance.h, line 634. I don’t know enough about Macintosh programming to say whether it is possible to employ this cursor from a Cocoa-based application. This entry was posted in Blog and tagged adobe, mac on 29 May, 2010 by david.